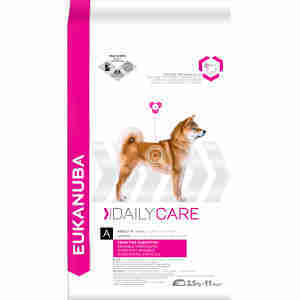 Eukanuba Daily Care for sensitive digestion has been developed specifically for adult dogs with delicate digestive systems. This sensitive diet food is made with a rice base for easy digestion, combined with beet pulp and prebiotics for a healthy gut. The high-quality ingredients are easier for your dog's system to absorb, so you can be confident that they're getting the full benefit of the muscle-building protein and bone-boosting calcium in each bite. Clinically proven antioxidants support your dog's natural defences, while omega acids keep their coat soft and glossy – so your pet's outside is as healthy as their insides. Dogs of all breeds and sizes can suffer with a sensitive digestive system. Left unchecked, symptoms can develop into serious health problems, as your dog struggles to absorb the nutrients in their food. An upset stomach can be stressful, both for pets and for the owners who take care of them. Symptoms can include vomiting, soft stool, lethargy and hypersalivation. Your dog deserves to be comfortable, so if they're struggling with their stomach, digestion-friendly foods are a good step towards a healthier, happier life. You can gradually replace your dog's old food with Eukanuba Daily Care over the course of four days, making sure to adjust the portion size according to their weight. Dietary requirements don't have to be difficult to manage, but it's important to speak to your vet to rule out any allergies if you do decide to alter your dog's diet. Chicken (> 20%), rice, maize, sorghum, animal fat, fish meal, poultry meal, dried beet pulp (2. 8%), chicken digest, dried whole egg, brewer's dried yeast, fructooligosaccharides (0. 8%), potassium chloride, sodium chloride, sodium hexametaphosphate, linseed, DL- Methionine. Protein (%) 23. 0, Oil and Fat (%) 13. 0, Ash (%) 6. 5, Fibre (%) 2. 5, Moisture (%) 8. 0, Calcium (%) 1. 00, Phosphorus (%) 0. 80, Vitamin A (IU/kg) 12000, Vitamin D3( IU/kg) 900, Vitamin E (a-tocopherol) (mg/kg) 200, Copper as Copper II sulphate (mg/kg) 20, ß- carotene (mg/kg) 1, L- Carnitine (mg/kg). Vitamin A:12000 IU, Vitamin D‡:900 IU, Vitamin E (à-tocopherol):200 mg, Copper as Copper II Sulphate:20 mg, ß-carotene:1 mg.
bess a pointer cross from New Zealand has had ops on her tummy after going through a spell of eating things she shouldn't and has had a sensitive tummy, having this food has solved this issue and now 11 is very healthy slim and active with a shiny coat, people remark how good she looks for her age, recommend this product. I have used Eukanuba for well over 20 years having been introduced to it my the breeder I purchased my german shepherd from. My oldest dog now 13 years old is now on the sensitive care product which helps with his digestion as he is an old boy. Everyone comments on the condition of his coat (he is a sheltie and how lively he is for his age. My young dog is 4 years old and a dachshund and he has also been on Eukanuba since we purchased him and is thriving. I cannot recommend this dog food enough and many of my family and friends have changed to it. Having a Boston Terrier its been a struggle to find a food that is easy on his system. After trying lots of brands, sensitive digestion has been great. His stools are now firm and he even finishes all of his food! Really happy that i can finally stop searching for a suitable product as i believe ive found the best. Eukanuba Sensitive Digestion is the only food my dog can eat without any problems. She has had a sensitive digestion for years and this food works without problems. Brilliant.